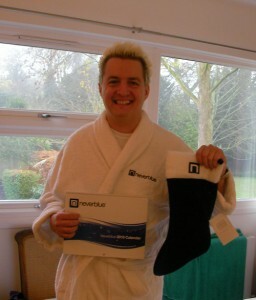 Neverblue came up top trumps this Christmas with this great bathrobe, Calander and Christmas stocking. Neverblue even got my size right. As you can see from the photo I love the gifts. I was also getting a great ribbing from the photographer for taking this photo. Wow – Santa came early to your house! What’s in the stocking Murray? Very cool! The bathrobe looks comfy!